Presentations Presenting at the APTEI 2014 Symposium: How faulty biomechanical reasoning may increase pain and disability. Medbridge Health Breakouts: Where does Biomechanics Fit? 1. The Runner Academy: Running injuries, posture and treatments. A 4 session program to improve your running and decrease your chance of injury. $400.00 for the initial 1 hour session plus 3 follow up sessions. The timeframe is surprisingly flexible. Some people need a follow up session within a week of the initial evaluation. Others might need a follow-up session within 3 weeks. Having this flexible time frame allows us to tailor the program to your needs. Can I work with my existing coach or personal trainer? Absolutely. In fact, this is encouraged. I regularly work with running or triathlon coaches to create safer and better training programs. If you already work with a personal trainer we can speak with your trainer about encorporating the running performance program into your existing exercise sessions. I am physiotherapist and chiropractor with a MSc in Exercise/Spine Biomechanics. I have published more than 20 peer-reviewed academic papers on exercise science and injury. I regular work with runners and multisport athletes from beginner's to Olympic athletes. I currently write injury prevention articles for Triathlon Canada. I am also an instructor with therunningclinic.ca - Canada's, if not the World's, leading course on the prevention and treatment of running injuries. Last, I am the clinical director of Medcan's Run Well 3D Kinematic Analysis Program for Running Injuries. 3. Gait Modifications for Runners. The purpose of this article is to highlight the clinical decision making process during kinematic running analyses - focusing on evaluating the kinematic risk factors for running injury and not kinetics. All of the above variables have been either documented as being elevated in runners with injury (correlated) or have been found to be precede the onset of injury (longitudinal research). As with most human function nothing is that straightforward though. To confuse us, all of the above factors have also been shown to have NO relationship to injury in other studies. We now have this dueling evidence base where it is very easy to cherry pick research supporting our ideas. Pain and injury are multifactorial – simply suggesting that an injury is due to altered kinematics ignores the wealth of research highlighting the many variables that influence the pain experience. Thus, our clinical decision making is never as simple as finding a “flaw” and assuming that that is the driver of the injury. So how can we view these “flaws”? Red herring: the flaw is not a flaw but merely an expression of the large amount of functional variability that exists across people. The flaw preceded the injury and will remain even with changes in pain. To determine the significance of a kinematic flaw a few assumptions regarding the nature of injury and pain are necessary. These are naturally open to debate. First, injury and pain should not be conflated. Runner’s can have tissue anomalies that many might view as pain (e.g knee OA, hip labral tears) and have no pain. They can also have pain with no evidence of disruption in connective tissue. Pain can be viewed as the brain’s response to the perception of a threat. With many factors (cognitions, past experiences, expectations, emotions) influencing the brain’s decision to output pain – nociception created by mechanical deformation of nervous tissue being just one. With runner’s all of these factors can be viewed as stressors inputted into the system. An ideally adapting system (at least for those who want to run pain free) would be one where the brain does not output pain. Pain occurs when some immeasurable threshold is reached where the brain perceives a sufficient enough threat to output pain. An injury can be viewed as the body’s failure to adapt to the imposed loads that exceed the threshold for positive tissue adaptability. It is assumed that both the body and brain have the ability to positively adapt to imposed demands or loads. It assumes with appropriate and graded loading that both our connective tissue strength and our pain thresholds can be improved. Injury-free and pain-free running require us to stay below these thresholds. Altered kinematics may either create an initial noxious event leading to nociception, may contribute to nociception by continuing to sensitize nervous tissue or may even indicate a movement habit that a runner has fallen into and nociception itself does not need to be present. This habit of movement may even, to quote Lorimer Moseley, “facilitate protective neurotags”. What might initially have been a movement flaw that helped the system (e.g a defense) has now become associated with pain that has no further value. Our conundrum as clinicians is not determining whether the altered kinematic is cause or consequence of pain but rather determining if there is value in trying to address it. Can the kinematic flaw be reasonably linked to the runner’s pain or injury? Going back to the assumption that injury or pain may occur when the demands on the body exceed its ability to adapt can we suggest that the kinematics measured might load the area of injury to such an extent that mechanical pain would occur? If a patient presents with medial leg pain, appears to pronate a great deal and the speed of that pronation appears elevated we might be able to suggest that those variables relate to the pain as biomechanical link of increased tissue strain can be made. This idea can be bolstered with post-hoc reasoning if simple interventions that might address the flaw (e.g taping an arch, running with a wider step width) positively change the pain experience. This thinking would be bolstered by some research that supports this link. But wait you naturally scream at me, there is lot of research suggesting pronation has no relevance to injury. This is absolutely true and leads us to a second question. What factors can mitigate or amplify the relevance of this flaw? Rather than increased pronation and increased pronation velocity being interpreted as a defect we might argue it is merely a red herring. We see this in a number of elite runners with massive amounts of pronation and massive amounts of mileage and speed. Yet they have no pain. What factors might mitigate the proposed risk of having this assumed kinematic flaw? Could those with what appears to be a running kinematic flaw have adapted to this ‘flaw” over time? Have they progressed their mileage slowly over years? In some instances, flaws aren’t flaws. The runner is fully adapted to that gait style. On the other hand, a novice runner may exhibit running mechanics sometimes associated with injury. 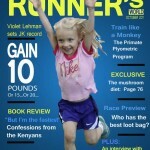 She may be able to run pain free for awhile until suddenly pain develops with no change in her training. There has been no change in the loading placed on nervous tissue yet pain is experienced. A possibility exists here that the sensitivity of her system was changed. Thus her threshold for pain or injury was decreased. Since multiple factors influence this sensitivity it is important to attempt to address those factors. One such intervention would be to address the mechanics of her gait. What’s great with treating running injuries is that we don’t always need to change the kinematic flaw. We have a number of studies showing that gait retraining can change both pain and running kinematics but we also have research suggesting that interventions can result in changes in pain with no changes in kinematics. In the latter instance, we can use the altered kinematics as a starting point in creating our therapeutic interaction. Much of what a manual therapist does would fit into this category. Again a multifactorial approach may be necessary. Interventions may be pain physiology education, education about tissue and nervous system adaptability, taping, temporary orthotic use, gait retraining, manual therapy, movement therapies and alterations in training loads. I believe most runners can keep running. In fact, they need this stressor to adapt. If we teach runners the importance of the adaptability of their system then they will understand the importance of a graded return to activity. Gait retraining would also fall into this category but it should be remember that gait modifications primarily redistribute forces during running. Thus a slow return to running with a new style is advised to again allow for the adaptation to the different stress. Last, we can use kinematics as a window into prescribing capacity or motor control exercises. Resistance training can be justified in running injury treatment both as a pain modulator and under the idea that a tissue’s response to loading can be improved – increasing injury threshold. A future post will elaborate on the clinical decision making of these interventions. A helpful course on understanding running biomechanics and injury can be seen in this link. We don’t know the ideal way to run and by extension we don’t know what are true kinematic flaws in running. We know that pain and injury are multifactorial and taking this big picture view of rehabilitation is helpful. Identifying what may be kinematic flaws can still provide a window into interacting with a patient. Addressing kinematic flaws, along with a runner’s clinical presentation, through a multimodal approach (e.g. desensitization, education, gait retraining, exercise selection, activity modification) is a comprehensive approach that recognizes clinical uncertainty. Case Study: Unexplained dead leg when running. Altered nerve tension? In the video below I noticed two things that may be significant. This runner is predominantly a forefoot striker even at slow speeds. Quite rare. She essentially reaches out for the ground with her forefoot. If you notice her knee it is actually quite extended just before foot strike. This is not normal. See a kinematic review of running here. There is usually quite a bit of knee bend before landing and of course on impact. Simply, this runner overstrides with a forefoot strike. She does this both in shoes and in socks. This position is similar to the Straight Leg Raise test with a peroneal nerve bias and it may be contributing to the "funny" feeling in the leg. A review of running biomechanics with video can be seen here. I can't rule out exertional compartment syndrome but I also can't confirm that with ease as the test would take over 3 months to get here in Toronto. And Andy Franklyn-Miller (UK sports doc with a great deal of experience studying this type of thing - website here) would suggest that this test is even questionable for this condition and we might even want to question the condition itself. So I keep the exertional compartment idea in my head and look at other possibilities. Why I question the compartment syndrome is the positive response I get when I stress the superficial peroneal nerve with neurodynamic testing. I don't believe that this is a classic response for exertional compartment syndrome suggesting to me that we have an altered neurodynamic on our hands. - running changes: this is tough but our runner is working on a midfoot strike and is trying to cue the idea of landing behind her (this is impossible but it can get the idea across). - I also treat the "container" of the nerve. I do gentle soft tissue work (I used to be an A.R.T guy but I am much gentler now and don't believe the theory they propose) along the entire sciatic nerve. I think that I am really the nervous system and ultimately influence the muscle and the peripheral nerves with my manual therapy. You can explain this treatment anyway you like. I choose a neural based explanation rather than thinking that I am digging out adhesions. Sorry, don't know yet. Just started. Any ideas please let me know. I can say that after I gently treat the region around the sciatic, tibial, peroneal nerve we are able to decrease the sensitivity associated with the SLR testing. This is a good sign. I am cautiously optimistic. I feel like in the blogosphere and the popular running media that there is a love affair with all things barefoot. Barefoot running is associated with forefoot striking and there appears to be changes in the biomechanics associated with alteration in running form when compared with heel striking. However, the research gets presented as if it is very neat in tidy when in fact it is quite murky. This post is a work in progress. 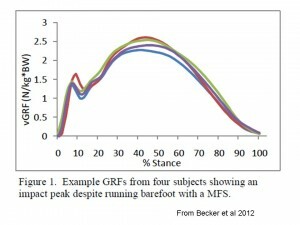 It attempts to summarize some of the work comparing barefoot running with shod running and the work that compares forefoot striking and rearfoot striking while running in shoes. I hope that I have conveyed that the results are quite conflicting. Hence, what a pain it was to try to summarize this work. This post will be updated consistently. Please view it as a work in progress. -a decrease in the amount of peak pronation or calcaneal eversion (Morley et al 2010) which is most evident in runners who pronate a great deal. Going barefoot decreases peak eversion from 10.3 degrees to 6.7 degrees in moderate pronators and from 14.8 degrees to 9.2 degrees in super pronators. -total eversion distance is increased with barefoot running. Even though there is less pronation the foot starts in a greater degree of inversion when barefoot. Therefore, the heel travels a greater distance when striking the ground to reach maximal eversion/pronation. In the following graph notice how the first "bump" is lower in the barefoot and forefoot condition when compared with the rear foot shod condition (Divert 2008). Ummm, is the initial impact transient eliminated with Barefoot running? He also provides this video showing the impact transient loss when running barefoot and forefoot striking. In the study by Divert (2008) three out of the 12 subjects continued to demonstrate an impact transient. 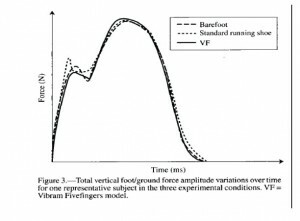 This difference may be due to the fact that other studies investigate youths who have always run barefoot while in the above graph (from Divert 2008) the subjects were just learning to run barefoot and may have not run a sufficient number of steps for the body to adapt and modify its kinematics. In effect, the sample used in the above study may have not had enough time to learn how to run barefoot to eliminate that impact peak. In contrast to Dr. Lieberman's work, other studies have also looked at habitually barefoot runners and have NOT found a complete loss of the impact peak, albeit a reduction was found when running barefoot or in Vibrams versus a standard shoe. Squadrone (2009) compared barefoot, shod and Vibram wearing runners in athletes who have had extensive experience running barefoot (3 of them having completed a marathon barefoot). In the following graph notice how the impact transient is still greatest with shoes, decreases with barefoot and is most modified with Vibrams (VF). Most importantly, notice how the impact transient still exists. These authors did not calculate the slope of this impact transient so it can not be directly compared with the work of Lieberman et al (2010). How can this impact transient still exist in minimalist or barefoot runners? One difference between Lieberman's group and Squadrone's group may be the degree of plantar flexion in the ankle that occurs at footstrike in both groups. In Squadrone's group the ankle is at 94 degrees - this means about 4 degrees of plantar flexion. In Lieberman's group the plantar flexion in habitually barefoot Kenyan youths is around 14 degrees. Not to be too confusing but the above authors also measured foot dorsiflexion at impact and found an ankle angle of around 94 degrees (4 degrees of plantarflexion) with a sole angle around 12 degrees (I believe the sole angle is the angle of the entire foot relative to the flat ground). Zero degrees would be flat while 12 degrees means the toes are pointing up relative to the ground (this is my interpretation, it was not explained in the article). This ankle angle in the barefoot condition is similar to the Squadrone's study of 94 degrees yet we see an impact transient as well as a greater rate of force development in the barefoot condition. My interpretation here is that while the ankle was slightly plantarflexed the heel still came down first (i.e. the sole angle was still pointing up). I don't know what the sole angle was in the Squadrone study but it certainly might help explain the difference between studies. Obviously barefoot running is no panacea for eliminating an impact transient. Additionally, there are other factors associated with barefoot running (e.g Kinematic variables: stride rate, stride length, ankle range of dorsiflexion, range of pronation) that may influence many of the kinetic variables (e.g. impact transient, ground reaction forces). And most importantly how does it relate to injury and performance? So lets look at these other variables. Very simply, barefoot running seems to shift someone from being a Heel striker to being a forefoot striker. A small amount of research has investigated the differences while running in shoes with a rearfoot versus a forefoot strike pattern. Can changing your foot position at foot strike influence Kinematics and Kinetics? They sure can, please read more. Dr Irene Davis has been involved in much of this research but there is surprisingly little published. Dr. Davis' published work often cites her unpublished lab findings when comparing a Rearfoot strike (RFS) with a forefoot strike (FFS). Some of what I cite below will refer to Dr. Davis' statements (Williams et al 2000 or Laughton et al 2003) in her introduction or discussion instead of her actual data (which I can not get a hold of). - the foot lands with greater ankle plantar flexion and is in greater inversion at foot strike in the Forefoot strike condition. -According to the work of Laughton et al (2003) forefoot strikers have greater leg stiffness in general but less ankle stiffness. They have less ankle stiffness because there is more time and range of motion for the ankle to bend. Essentially, there is more time for the ankle to spread out the joint torque during impact because the ankle moves a through a larger range with the forefoot strike (remember, the foot contacts the ground with the toes down in plantar flexion) (Laughton et al 2003). These authors also found that the knee does not flex as much in the forefoot strike condition as in the rearfoot strike conditions (30 degrees versus about 34 degrees) therefore there is greater overall leg stiffness. 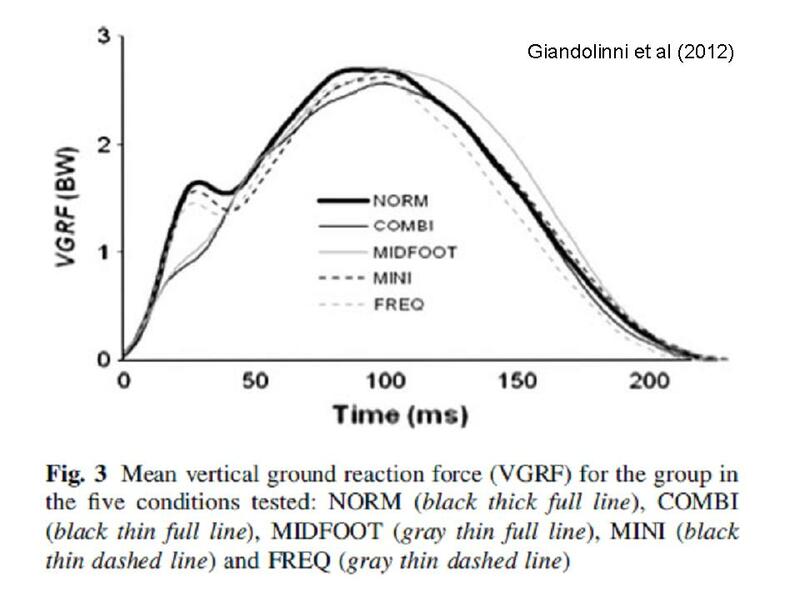 -Conversely, according to the work of Lieberman et al (2010) forefoot strikers have greater leg compliance (defined as the drop in the body’s centre of mass relative to the vertical force during the period of impact) meaning there is also greater Knee flexion as well as ankle flexion when striking with the forefoot. Dr Lieberman's website has an excellent video that shows modifications in the impact transient when striking with a forefoot in shoes. Unfortunately, this kinetic information is not accompanied with a great deal of kinematic information. However despite this decrease in the impact transient documented in the video the one other study that investigated Shod running and changes in foot strike pattern show different results. 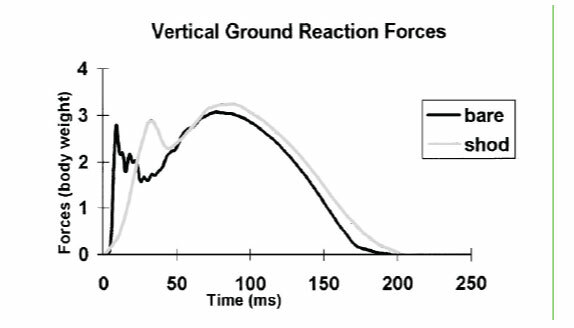 -Average and instantaneous vertical GRF load rate (i.e. the impact transient), however, did not differ significantly between the FFS and RFS patterns. -BUT...in the Laughton study the forefoot striking runners were different than your typical forefoot strikers. You might actually call the TOE runners because when their forefoot struck the ground they were not allowed to let their heel strike the ground. This is not what happens with barefoot/forefoot running. This may account for the differences in loading. What I take from this is that forefoot striking can certainly decrease the loading rates on the foot/shank to a similar extent as barefoot running. But again, it is not a SUFFICIENT condition. I would guess that it might even be possible to train yourself to run with a heelstrike but in such a manner that you decrease your impact transient. Work out of Dr. Davis' lab that gives feedback to individuals on their tibial shock shoes that people can learn to run softer and decrease the impact transient. In these studies (click here) no advice is given to forefoot strike and individuals wear neutral shoes. They are merely asked to run softer and are given feedback. I don't have a definitive answer for why the Laughton study shows no change in the impact transient yet Lieberman's work shows a significant decrease in the loss of the impact transient. My hunch is that other kinematic variables may influence the loading through the foot. 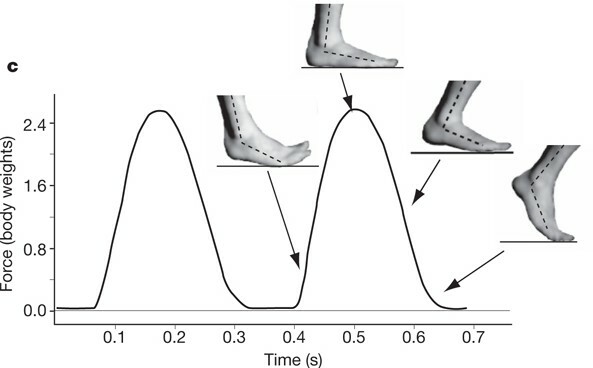 One explanation may be that if in the Laughton study there was no difference in the stride length when shifting to a forefoot strike from heel strike then this may account for the lack of a loss of the impact transient (couple this with the lack of the heel being allowed to lower to the ground - a type of impact absorption and this may explain our differences). - research investigating whether individuals could wear standard running shoes yet still be trained to run in a manner that mimics all of the kinematics of barefoot, forefoot strike running. -any research investigating the theory (I stress theory) that running in shoes influences plantar foot proprioception which in turn negatively influences running - this belief is very common and is always written about in a superficial manner. Yet there is not a lot of research investigating it. I will reserve an opinion. -a full body kinetic analysis comparing all the different foot conditions of running. Barefoot or forefoot strike running may be an excellent adjunct to the recreational runner as a training stimulus. It can be used as a form of strength training or rehabilitation. No research has looked at the impact transients with runners who run much slower than what is studied in these papers. Most of these papers have the slowest runners running 5 minute kilometres (an 8 minute mile). The vast majority of your recreational runners do not run this pace. If you run at 25 minute 5 km you will probably be in the top 10% of a large race (for example, at the 2010 Goodlife Marathon 5 km a 25 minute result put you 178th out of 2721) and the top 15% if you keep that pace up for a marathon. So, do we want to be telling all our runners to covert to a forefoot strike, minimalist shoe or barefoot based on the research of relative elites? the only correct :) answer is -----I have no idea. Good luck piecing this all together and stay tuned for more updates. Squadrone R, Gallozzi C. Biomechanical and physiological comparison of barefoot and two shod conditions in experienced barefoot runners. J Sports Med Phys Fitness. 2009 Mar;49(1):6-13. Divert C, Mornieux G, Freychat P, Baly L, Mayer F, Belli A. Barefoot-shod running differences: shoe or mass effect? Int J Sports Med. 2008 Jun;29(6):512-8. Epub 2007 Nov 16. Pohl MB, Buckley JG.Changes in foot and shank coupling due to alterations in foot strike pattern during running.Clin Biomech (Bristol, Avon). 2008 Mar;23(3):334-41. Epub 2007 Nov 19. 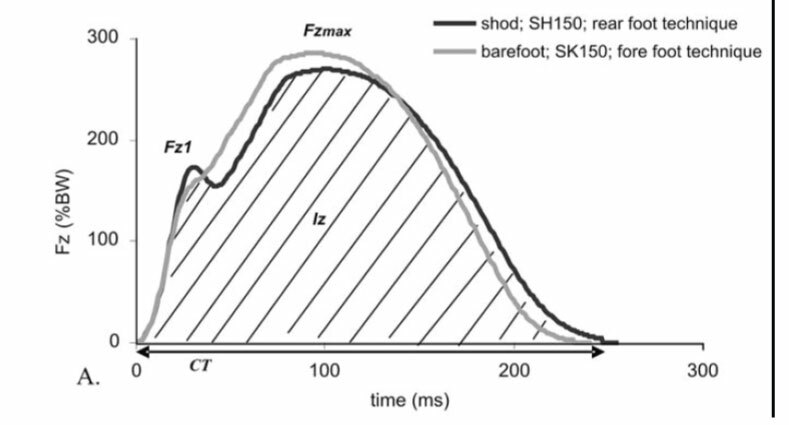 Morley JB, Decker LM, Dierks T, Blanke D, French JA, Stergiou N. Effects of varying amounts of pronation on the mediolateral ground reaction forces during barefoot versus shod running. J Appl Biomech. 2010 May;26(2):205-14. Lieberman DE, Venkadesan M, Werbel WA, Daoud AI, D'Andrea S, Davis IS, Mang'eni RO, Pitsiladis Y.Foot strike patterns and collision forces in habitually barefoot versus shod runners. Nature. 2010 Jan 28;463(7280):531-5. Williams DS, McClay IS & Manal K: Lower extremity mechanics in runners with converted forefoot strike pattern. Journal of Applied Biomechanics, 16(2): 210-218, 2000. McClay, I., & Manal, K. (1995a). Lower extremity kinematic comparisons between forefootand rearfoot strikers. In K.R. Williams (Ed. ), Conference Proceedings: 19t Annual Meeting of the ASB, Stanford, CA (pp. 211-212). Davis, CA: UC–Davis. McClay, I., & Manal, K. (1995b). Lower extremity kinetic comparisons between forefootand rearfoot strikers. In K.R. Williams (Ed. ), Conference Proceedings: 19th Annual Meeting of the ASB, Stanford, CA (pp. 213-214). Davis, CA: UC–Davis.